Easily helps determine appropriate headings for each leg when landing or departing the airport - a great teaching aid! Pros: Helps my wife understand downwind, base and final. Review: I purchased this for my wife so she could understand what I am doing when I land. The text is a little small and the numbers do not correctly line up in the cutouts for all headings. The computer is small enough that it can be easily lost. It ended up under the seat or in the back a few times. Not good if you are a renter. Review: works ok...but is way too small.....also very over-priced....$12.95 for about 50 cents in plastic..
Cons: Small enough that it can be hard to read. A: Are you looking for just a general flight computer? If so, you will want an E6B type computer. We have both metal and fiberboard varieties from Jeppesen, ASA, and Gleim. You can find them online here. The ASA E6-B Aluminum Flight Computer and the Jeppesen Metal CSG Computer are both good choices. For a plotter, the Ultimate Rotating Plotter is our most popular. 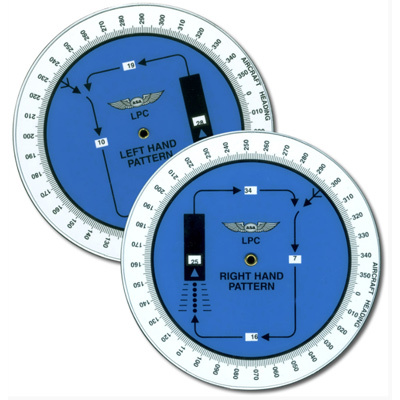 Q: Please tell me the diameter dimension of this landing pattern computer. A: The diameter is 3 7/8". A: Yes, this will show you the heading for each leg of the standard pattern.